Thekla Morgenroth is a post-doctoral Research Fellow of Social and Organisational Psychology and part of the ERC funded Context, Identity, and Choice project. They joined the Exeter SEORG group in 2012 after obtaining their Diplom from Dresden University of Technology. Since finishing their PhD in Social and Organisational Psychology at the University of Exeter in 2015, Thekla has been working as a post-doctoral research fellow with Michelle Ryan. Thekla interested in gender stereotypes and how they affect gender equality both in and outside of the workplace. 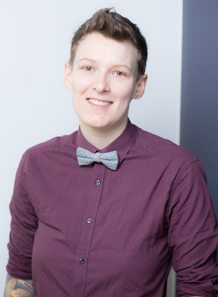 Thekla is also the current non-binary representative of the LGBTQ+ Staff network. If you have any questions or concerns about being non-binary at the University of Exeter, please get in touch with them. Thekla is currently involved in a range of projects including research on the psychological processes underlying the binary and essential perception of gender (with Michelle Ryan), reactions to disruptions to the gender binary (with Michelle Ryan, Thomas Morton, Emma Bäck, Marie Gustafsson-Sendén, and Anna Lindqvist), fit with leaders and work-life balance (with Michelle Ryan and Floor Rink), gender and risk-taking (with Cordelia Fine and Michelle Ryan), the glass cliff (with Michelle Ryan, Teri Kirby, and Antonia Sudkaemper), norms around the explicit discussion of sexual consent (with Emily Harris and Lena Morgenroth), gaming and gender (with Hellen Vergoossen, Benjamin Paassen and Michelle Stratemeyer), messages around the origins of sexual orientation and feelings of belonging in the LGBTQ+ community (with Teri Kirby), men's support for gender equality (with Antonia Sudkaemper, Michelle Ryan, and Teri Kirby), and the phenomenon of "mansplaining" (with Francesca Manzi, Michelle Ryan, Chris Begeny, and Belle Derks). If you are a motivated student who is interested in getting some research experience and think my research sounds interesting, don't hesitate to get in touch. I'm always happy to take interns! Outside of work, Thekla is somewhat of a nerd with a love for cats and a Game of Thrones obsession, who greatly enjoys board games,video games, and most post-apocalyptic and dystopian content. Terms 2 & 3: No regular office hours - e-mail me if you would like to meet.